We are a community of loving and caring people. For more than 75 years, Saint James’ has been a beacon in the Third Ward community of Houston, Texas. At the heart of our work and our worship we seek to bring others to Christ and grow in Christ like-ness. We are faithful followers of Jesus Christ as our Lord and Savior. We believe in the Father, Son and Holy Spirit. We believe God is active in our everyday lives through the power of the Holy Spirit. The mission of the Church is to restore all people to unity with God and with each other in Christ. You can expect a range of worship styles at our varied services. You can expect to be warmly greeted when you arrive. 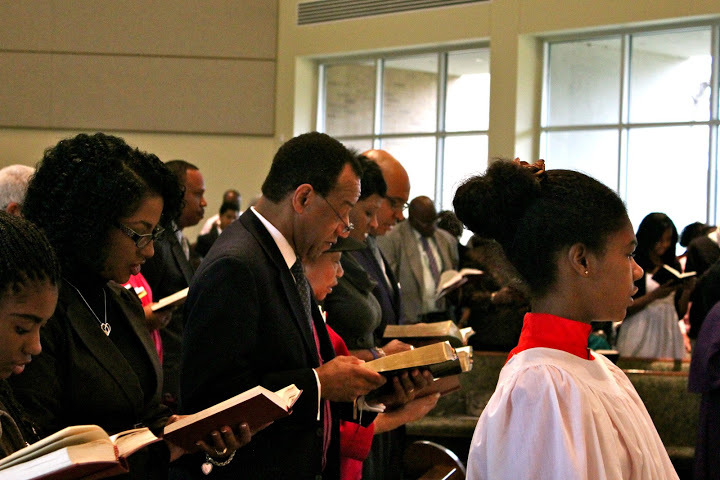 We are an Episcopal Church, and our worship follows a liturgy (work of the people). The order for the service is outlined in the Book of Common Prayer, the red book found in the back of the pews. The page numbers will be printed in the bulletin you receive when entering the church and will be referenced by the letters BCP. We also use the 1982 Hymnal and the “Lift Every Voice and Sing” hymnal (LEVAS), also found in the back of the pews. Holy Communion or the Eucharist (which literally means "thanksgiving") is the family meal for Christians and a foretaste of the heavenly banquet. All baptized persons are welcome to receive the bread and wine, and to be in communion with God and each other. After we hear the sermon, or having heard the Word of God proclaimed, having stated our basic beliefs in the Creed, and having confessed our sins to God, we express our desire to be at peace with God and each other by greeting one another. The exchange often begins with one person saying, “The peace of the Lord be with you,” and the other responding with, “And also with you.” The “Passing of the Peace,” as it is called, is based on the Kiss of Peace mentioned by the Apostle Paul in Romans 16:16. It also provides us with an opportunity to express our peace to one another before we engage in the Lord’s Supper, Communion, or Eucharist. Religious education is offered for children, youth, and adults between 10:30 and 11: 20 am. Adults meet in the Office Conference Room year round studying a variety of topics and participating in a book study during June - August. Our children’s ministry classes for kindergarten through 5th grade (elementary) meet from September – May in the Atrium classrooms behind Tucker Hall. Our middle and high school ministry group, SWAGG (Serving, Worshiping, and Glorifying God), meets in the SWAGG Hangout behind the Atrium in Tucker Hall. We'd love to meet you! Join us in Nettleton Hall in the next building for coffee immediately after the morning services. Our priest is available after each service in case you would like to ask a question, ask for prayer, or just say "hello." A variety of adult Bible Study groups meet throughout the week. Tuesday Evening Bible Study - The Tuesday Evening Bible study group meets for prayers and Bible study led by the priest weekly from 6:00 – 7:30 p.m. in the Parish Hall. Wednesday Bunch, Wednesdays, 10 am – noon, Parish Hall - Seniors, aged 50 and older, gather for worship, fellowship, lunch, and Bible study. Worship with Holy Communion begins at 10 am. We hope you will find St. James’ to be a place where you feel welcome and are spiritually fed. Should you wish to make a deeper commitment, we would love to have you become a part of this fellowship of believers. For more information about St. James’, the Episcopal Church, or about becoming a member of St. James’, contact the Rev. Victor J. Thomas, Rector, at revthomas@stjameshouston.org.